A Piece Of The Action: THE 100TH SPOTLIGHT! 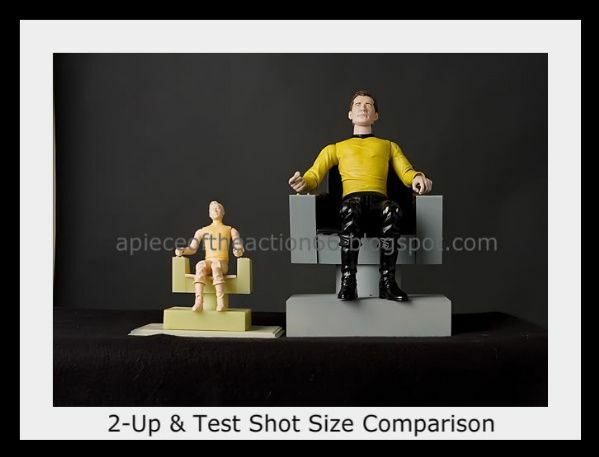 Unproduced Palisades Toys Captain Kirk & Gene Roddenberry 2-Pack Special Feature! So I've reached 100 consecutive spotlights! Woo hoo! 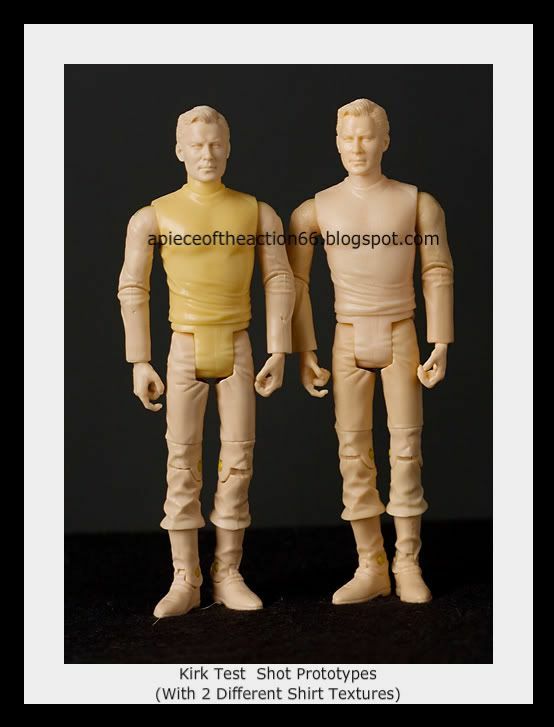 I thought that occassion deserved a little something special, so I figured it was time for a super-deluxe spotlight on the unproduced Palisades Toys Captain Kirk and Gene Roddenberry 2-pack! There's not that much info on the web on this pack, so I did my best to make this spotlight the most compete historical and pictoral reference point for it on the web. This spotlight features a bunch of pictures from the production process of the set. I threw a quick caption under each one so you'd know what you were looking at. These pics came from 2 sources: Ken Lilly, who graciously lent his time and pics to the writing of this, and from my wife Bobbi, who also graciously offered her help in photographing pieces in private collections. Thanks for both of your help! Now onto the history of the set! The earlier 2000’s were a pretty quiet time for Star Trek toy collectors. Playmates had ended its run with the franchise in 1999, and the Art Asylum/ Diamond Select era was still years away. Star Trek was pretty much non-existent on toy shelves. 2002, however, would mark Star Trek’s 35th Anniversary and a new company was poised to step in and put a fresh spin on the license. 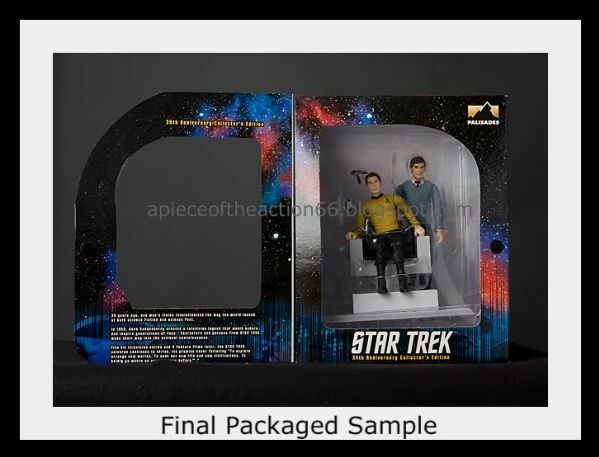 Palisades Toys (makers of the popular Muppets figure line) pursued the license and solicited their first foray into the world of Star Trek; A highly detailed Gene Roddenberry and Captain Kirk 6” action figure 2-Pack, complete with Captain’s chair. 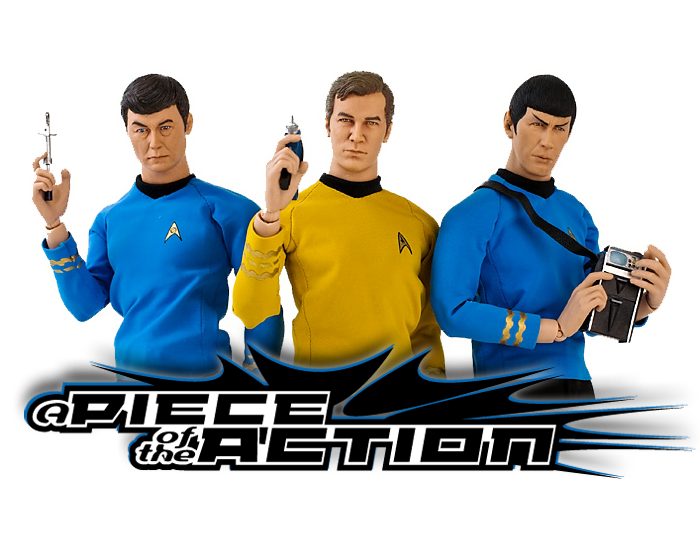 It would have been the first time Roddenberry had ever been made as an action figure, and the set was more detailed and realistically sculpted than most of the previous Star Trek toy offerings. Fans were excited to add the item to their collections and any future offerings that Palisades released. 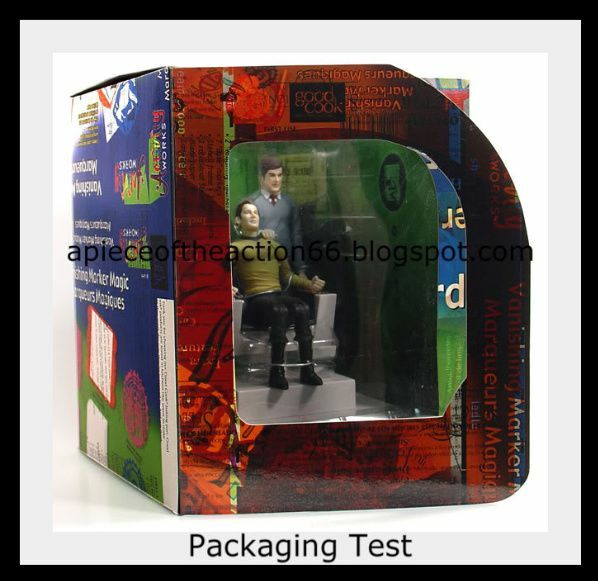 Unfortunately, the set never saw the light of day and no other Star Trek items were ever released by Palisades Toys before they closed their doors. Kenneth Lilly, now the Director of Product Development for The MVP Collection, was the man behind that set. He was the Director of Product Development and eventually the Vice President of Product Development at Palisades Toys. He’ll be sharing with us the story behind its development and eventual cancellation. -What lead Palisades to go after the Star Trek license in the first place? We (Palisades) were like most other companies out there who made the kinds of collectibles we did, always looking for a new licensed item we could make. We would have meetings where the entire company would get together in a conference room and throw out ideas of stuff to do. One of those ideas was Star Trek. Playmates had not been making stuff for it in quite a while and we knew the 35th Anniversary was coming up. -What role did you play in the development of the 2 pack? 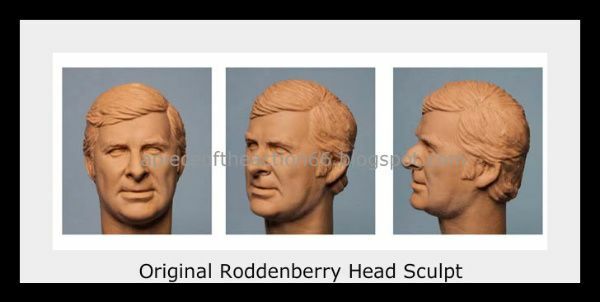 The initial driving force, and what I think really sold Paramount on letting us do this, was my own desire to make a figure of Gene Roddenberry. I was a big Star Trek fan and a Star Wars fan, and I always liked the George Lucas X-Wing Pilot that had been released by Hasbro. I thought it was a great homage to the creator of the Star Wars Universe. 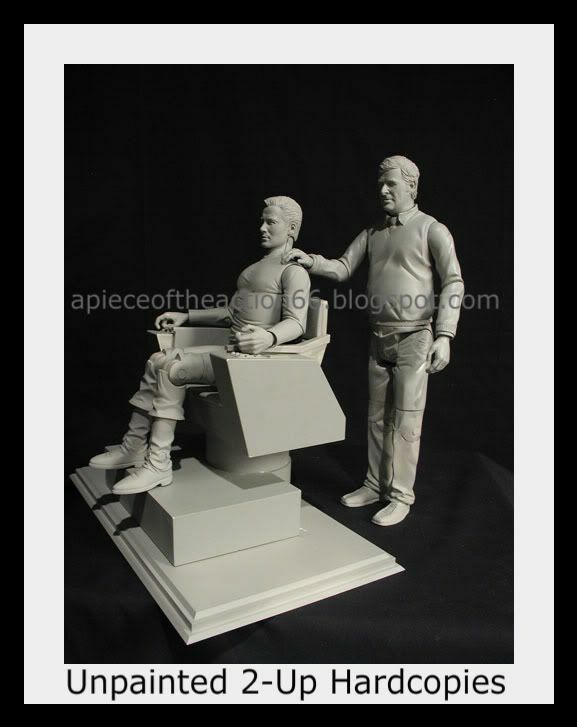 So, for a 35th Anniversary figure, how cool would it be to do a Kirk with Roddenberry and a fully realized, fully detailed command chair? We all liked the idea, thought it would be fun, and we got the license to do it. My role was the same for the Trek set as it was for all the products at Palisades, designing it, art directing the prototyping of it, managing production of it and so on. -Something like this pack must involve a lot of work that we as fans don’t really think about when we see an item on the shelves. Can you give us a quick rundown of the development process? The 2-pack started off as a concept that was then developed into design sketches. 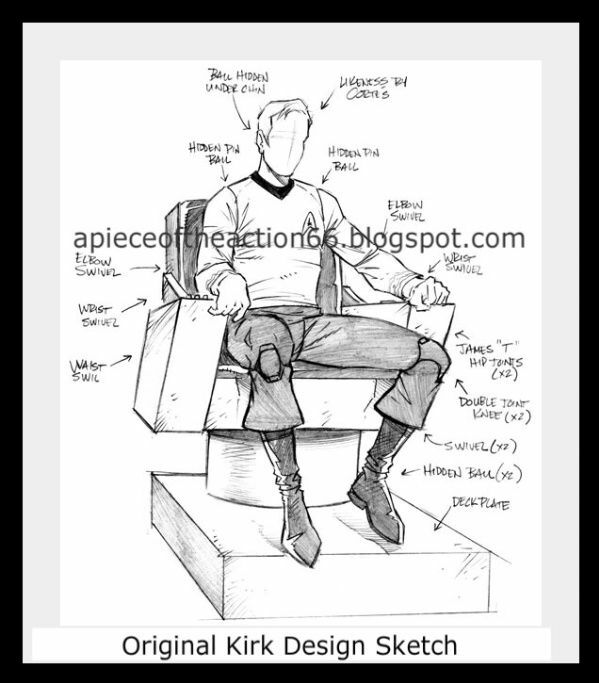 Once a final design was rendered out and approved, the concept sketches went to two different sculptors; one who handled the humans, the other who handled the fabrication of the command chair. We got a ton of help on the command chair via great blueprints, which happened to be easily accessible because of the recent Scotty episode on TNG where they rebuilt the original series Enterprise Bridge. The sculptors worked out their original sculpts in 2-up scale (2-up sculpting was not necessary the way it used to be from a manufacturing standpoint, but it helps with likeness). From those sculptures, resin casts were made and painted for approval from the licensor. Once we got to a point where everything was approved, we moved everything over to China with all my production notes in a binder to instruct the factory how to get the piece engineered and manufactured: Through various stages of gypsum ‘working models’, to plastic test shots, to painted plastic samples, and to pre-production packaging. I was out there in China for a bulk of the reviews on site. Because timing was so critical I had to stay out there for several weeks so that I could review stuff the same day it was ready instead of waiting the two days for FedEx on each round. Ultimately we got all the way to final packaged samples, got some basic approval (with some running changes planned) and we were ready to go. A bit late, but still with enough time to make the product…but the sales were an entirely different issue. -That sounds like a whirlwind process! Were there any major ‘speed-bumps’ in the process? 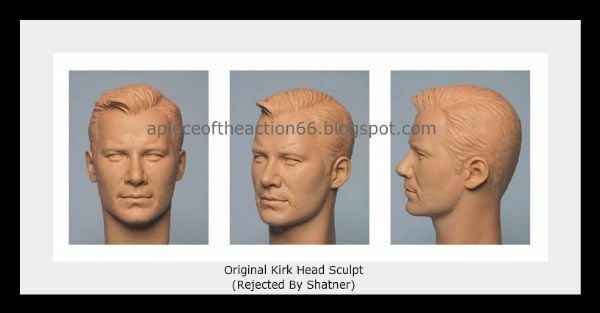 Well, we sent in a beautiful Shatner head sculpt, it looked like a strapping young Kirk from Star Trek’s inaugural season. Shatner gets ahold of it and forces all these changes to the piece, delaying us a TON. The final result was sort of an amalgamation of young Shatner and early movie Shatner. Never let a star make comments on their own likeness. They just don’t have the right kind of objective perspective, and that might be true of ANYBODY really, not just a star. 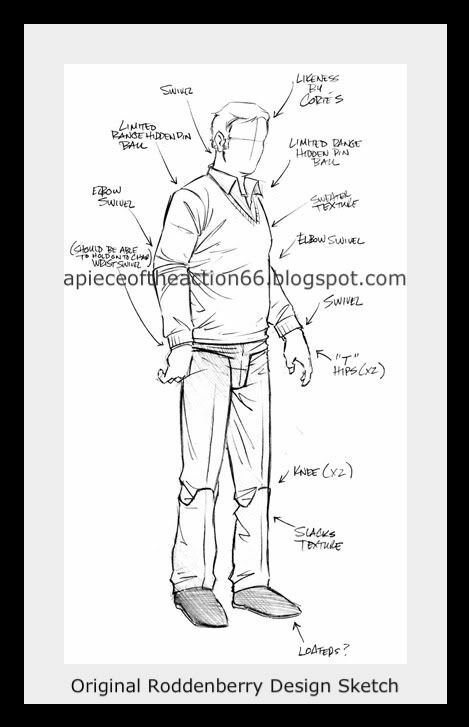 We paid a premium price to a fantastic likeness sculptor to nail the head in the first round because of our timing issues, and Shatner’s reviews of it ironically contributed to missing the contractual deadline we had. It wasn’t the only reason the piece did not make the deadline, but it was definitely a contributing factor. Of course, the truth is that William Shatner probably never even saw it, and it was probably reviewed by his ‘people’. -How far did the product make it before it was canceled? What stages were finished? We got very far on it before the bottom dropped out. We had two cases of 12 final, finished pre-production samples, and I mean finished. Full packaging, finished, fully painted figures inside. The figures themselves were as close to what you would get to the final product, though not ‘mass’ produced per se, but produced like they would be at the factory only by a small group called a ‘sample team’. -It’s pretty heartbreaking that it never saw the light of day. I have seen prototypes of various stages of the set and I can’t express how nice the pack would have been had it made it to shelves. What lead to the cancellation? Two things…time and sales. We took the gig with the knowledge that we had almost no time to get it done by the Paramount deadline, but we tackled it with extreme heat and while we were only a few weeks off of the overall deadline we ran into an additional issue: sales. Nobody in the retail world wanted to buy it. They had been so burned by some of the later Star Trek products from Playmates that they resisted. Every major retailer turned it down. And since we were not a direct-to-consumer company, we were at the mercy of the action figure buyer for retail chains and stores, one of the struggles we faced with ALL our products and which eventually led to the company closing its doors. Some smaller retailers, online and such, that we dealt with directly wanted to buy the 2-pack, but not a single major chain took it and the overall numbers because of that were appalling. 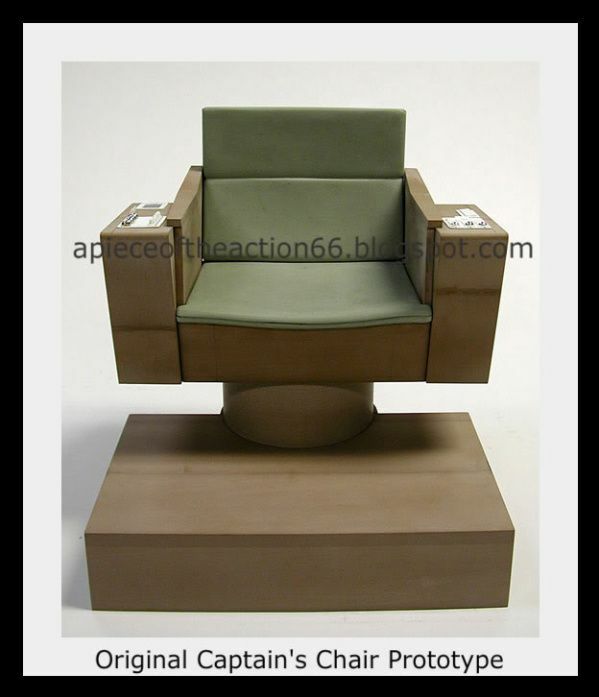 -Were there any other Star Trek products on the drawing boards from Palisades? Oh yeah…we tried to throw our name into the mix for the main license of all the shows and films that Art Asylum eventually got, which then sort of shifted over to Diamond Select. I had a very extensive line plan of figures and resin products and stuff but in the end Paramount selected AA for the gig. 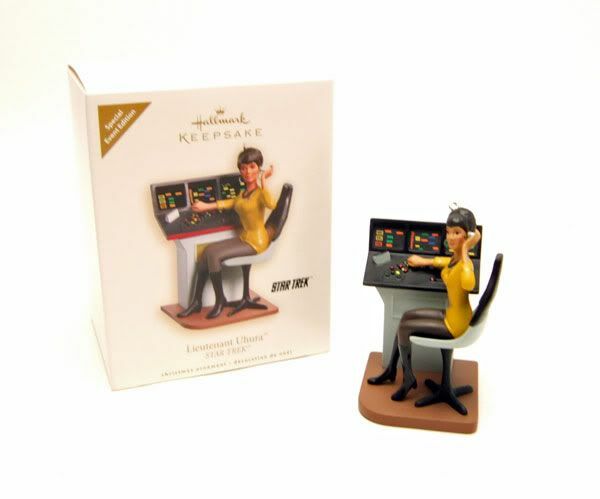 So to celebrate this 100th spotlight (and the fact that tomorrow just happens to be my birthday) I'm going to give one lucky reader a SDCC 2009 Exclusive Uhura ornament! All you have to is shoot me an e-mal at potacontests@live.com with your name and zip code (please put "Uhura giveaway" in the subject line) BEFORE 11:59 p.m. EST on Monday, August 10th. I will pick one e-mail at random to receive the prize. The only thing I ask is that you please only enter once, and that you cover shipping cost. Thanks and good luck! 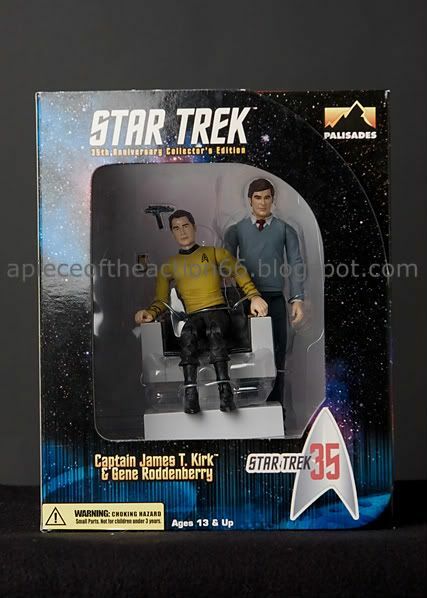 That Roddenberry figure looks like it's ready to have an affair it's secretary, and then break into a studio and cut up some film! Very interesting article. I had wondered what happened to this set. This website is not endorsed, sponsored or affiliated with CBS Studios Inc. or the "Star Trek" franchise. The STAR TREK trademarks and logos are owned by CBS Studios Inc.